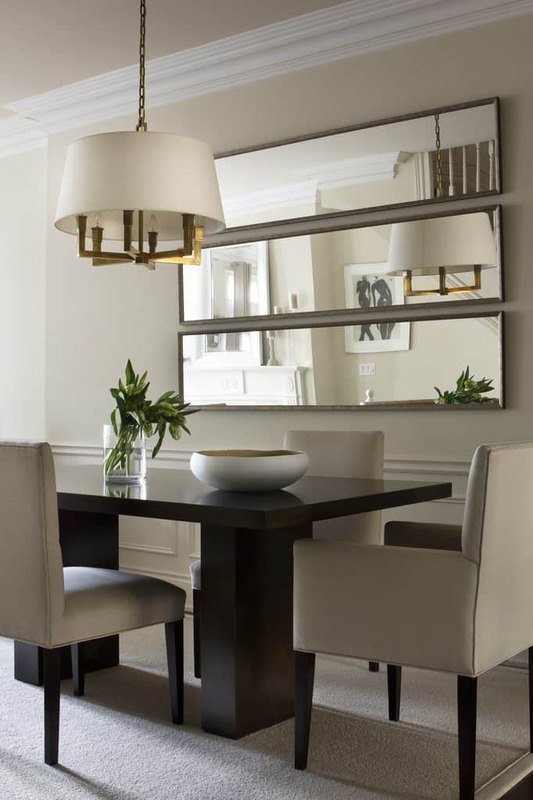 Are you looking for ideas to update and refresh your dining room? 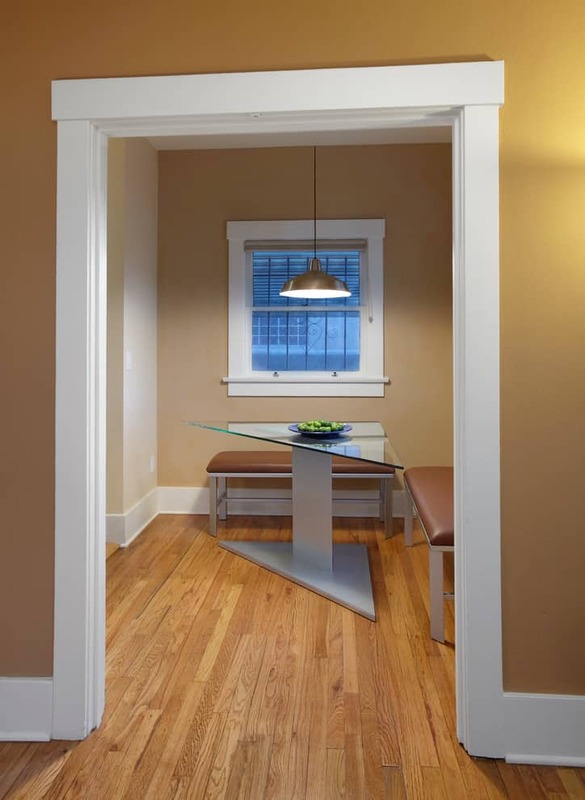 One of the best ways to find such ideas and inspirations is to look at pictures of popular dining room designs. 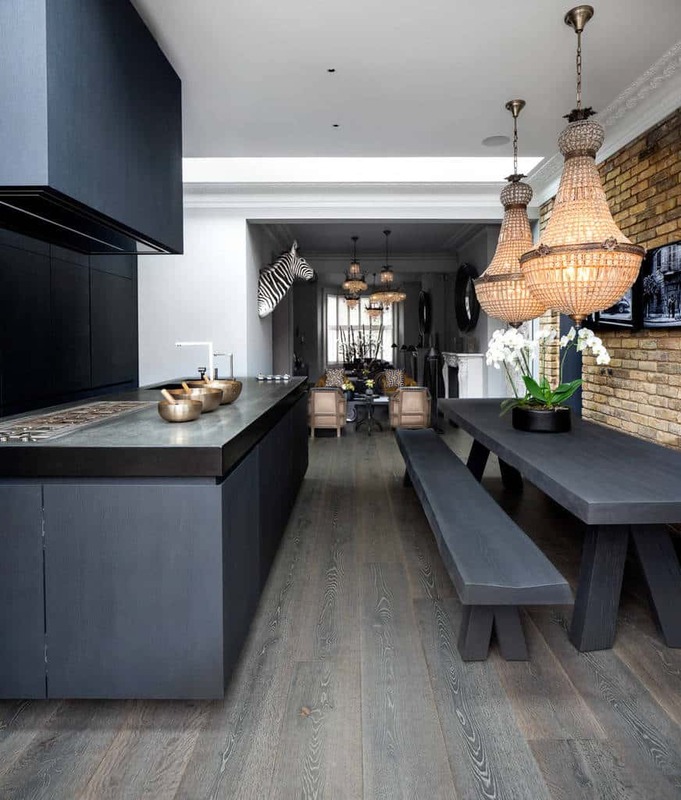 Such images can provide you with inspiration, ideas for specific finishing touches in style and decor, and even maybe ideas for a complete renovation. 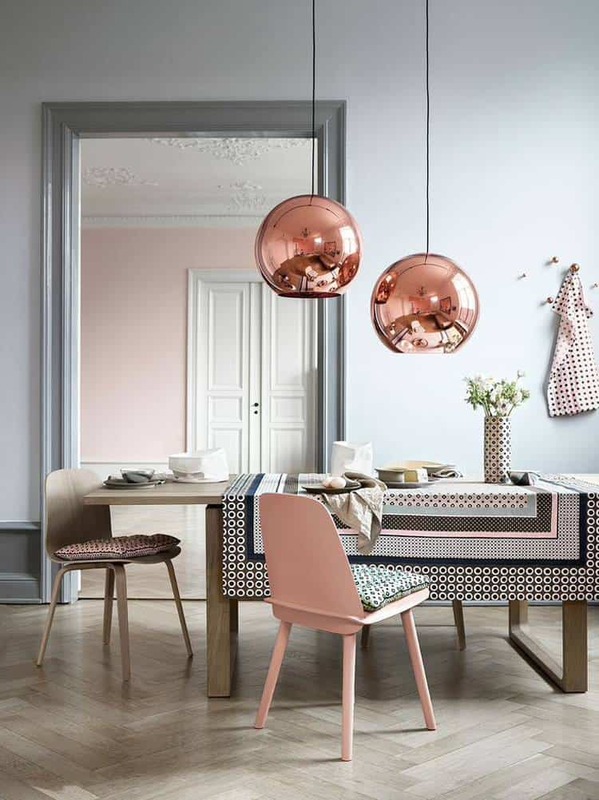 Below you will see 29 beautifully colorful images of design inspirations you can use for your dining room. There are a wide variety of ideas here. Maybe the beauty of simplicity suits you best, or perhaps midnight sophistication is more your thing. Classic white molding is a choice both popular and traditional, while gigantic gold-toned ornaments are a more daring choice. Retro chic designs are always fun, while turquoise fabric wallpaper gives a distinct look of luxury when combined with cherry-wood furniture. These are just a few of the ideas you will find. Enjoy! 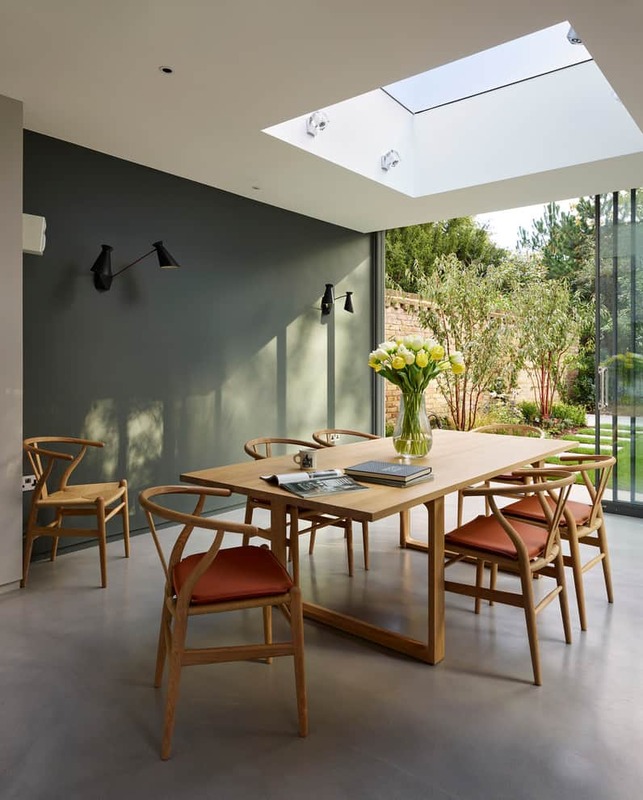 This dining room’s sage green walls are pleasantly refreshing, and they nicely complement the chairs’ terracotta cushions. 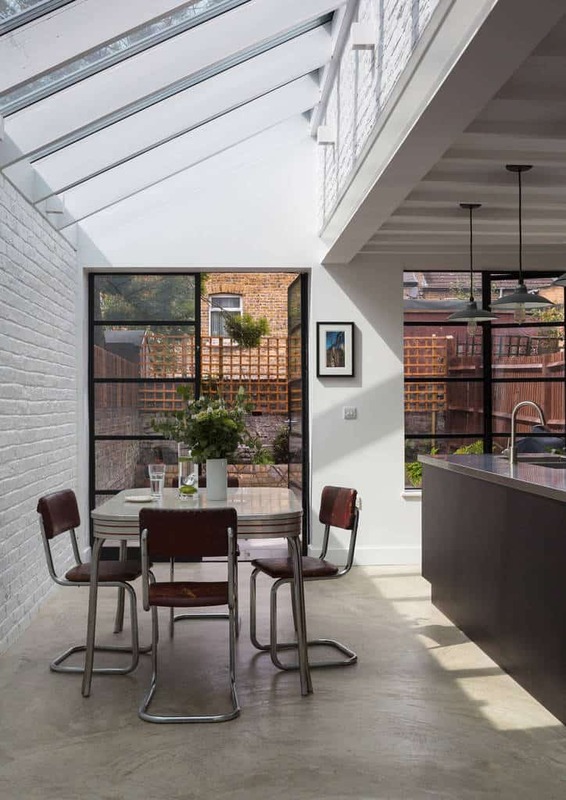 A skylight elevates this room to a whole new level. This dining room’s rustic barn-inspired door is very unique and is an interesting accompaniment to the room’s otherwise sleekly sophisticated features. Lime and white are always a wonderful mix. 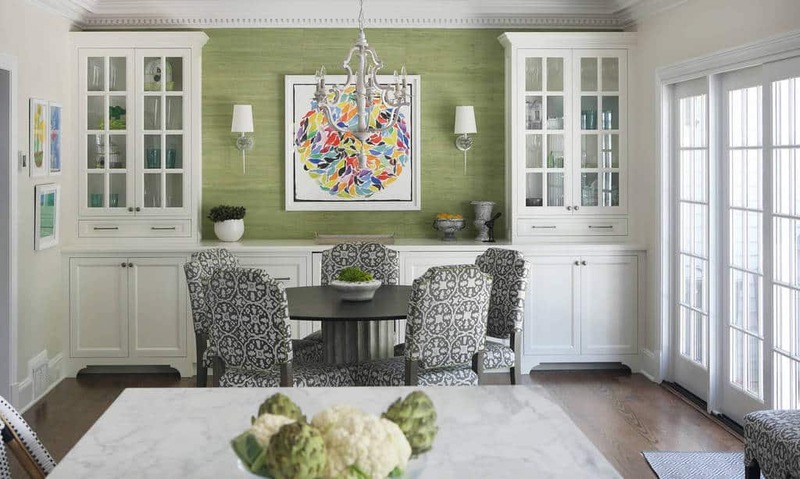 This dining room’s textured lime wallpaper and white cabinetry are a case in point. 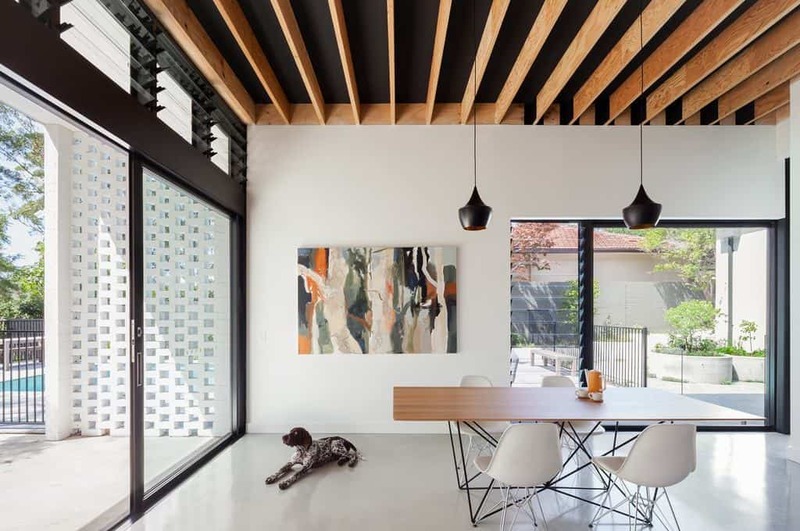 This dining room’s exposed white rafters provide a striking contrast to its gorgeous dark-wood floors. 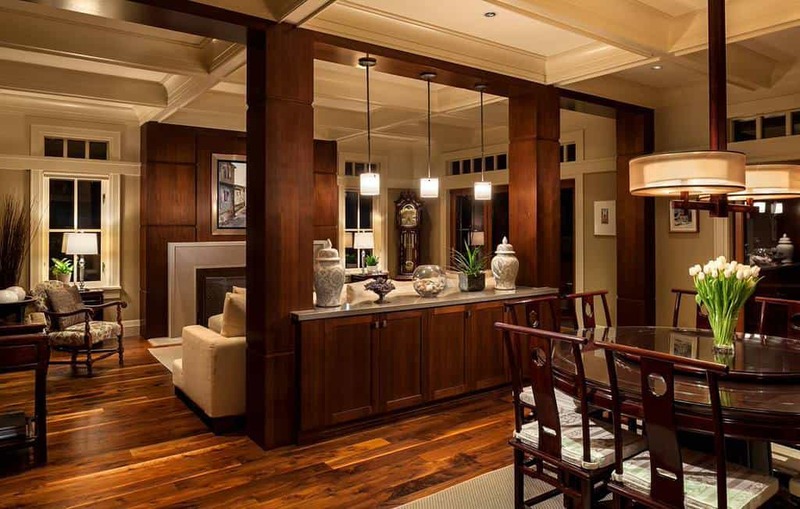 These sliding doors help allow large amounts of glowing daylight into this stylish space. These large gold-toned hanging ornaments are equal parts surprising and stylish. Midnight-toned textured wallpaper and a chandelier with hematite tinges are instrumental to this dining room’s sophistication. This room’s classic white molding works well with its other classic design elements. 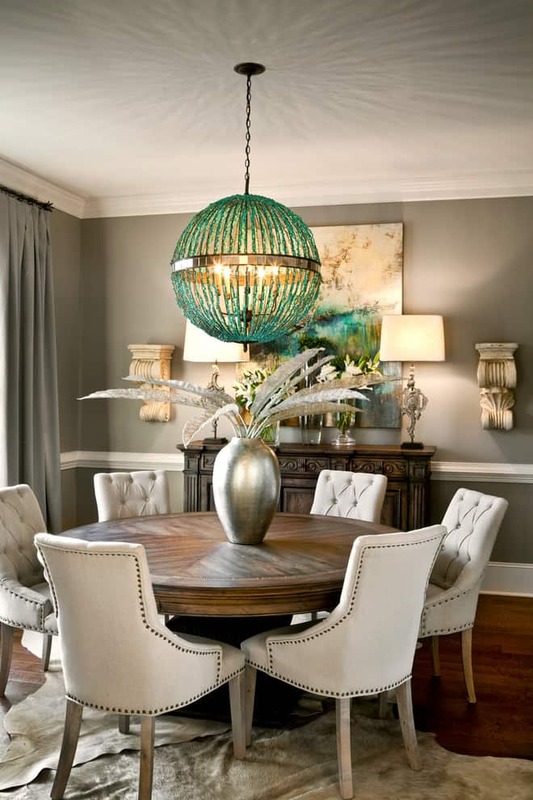 A large silver-toned centerpiece is an excellent accent for many dining rooms. Photo by Current Works Construction Inc. 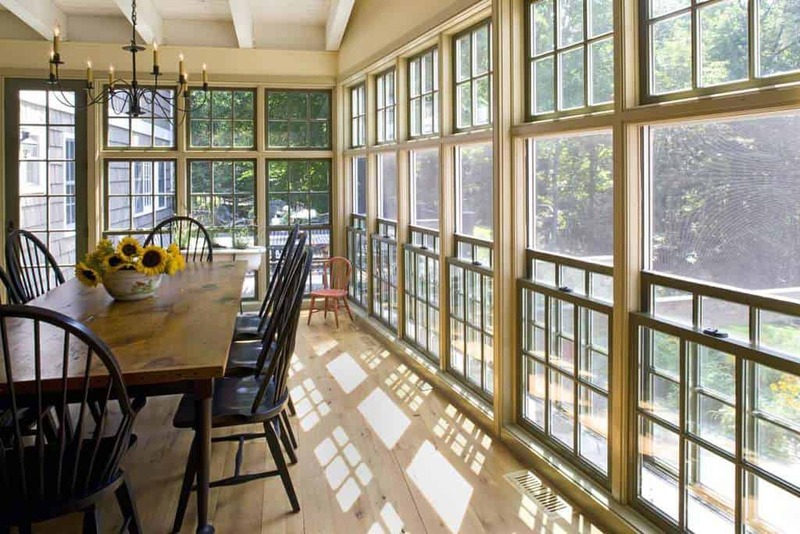 Surrounded by windows, you’re sure to enjoy a sunny breakfast in this dining room. Camel tones are always a sophisticated choice of wall color. These quilted suede-finish chairs are plush and fashionable. 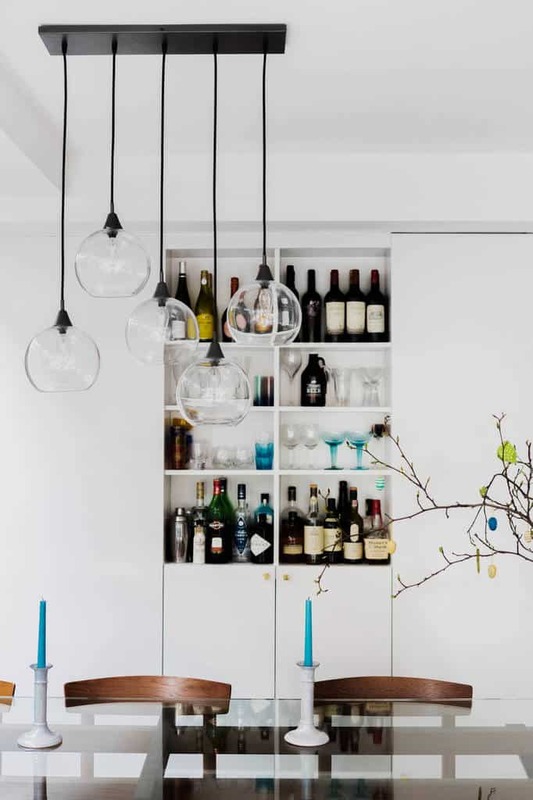 This dining room’s shelf space is ideal for wine-enthusiasts and people who love to entertain. 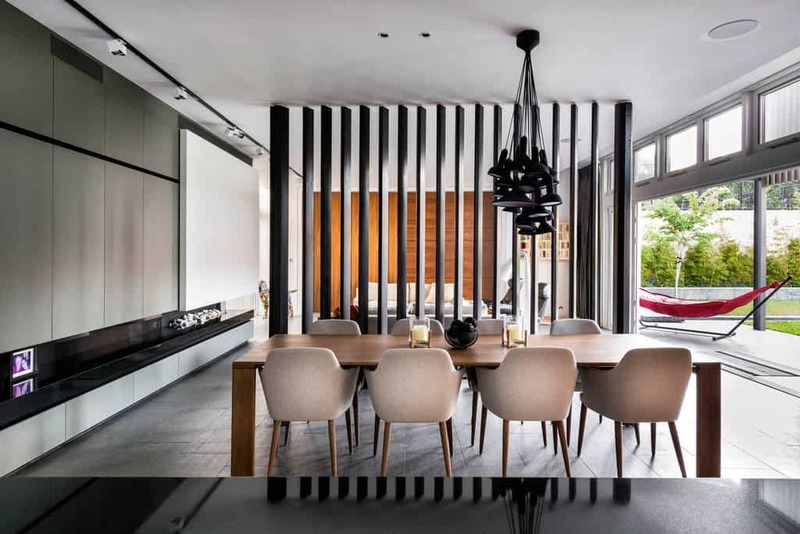 This combined dining and living room features a sort of see-through screen separating the two sections. This stunning icy white chandelier is the focus point of this dining room. 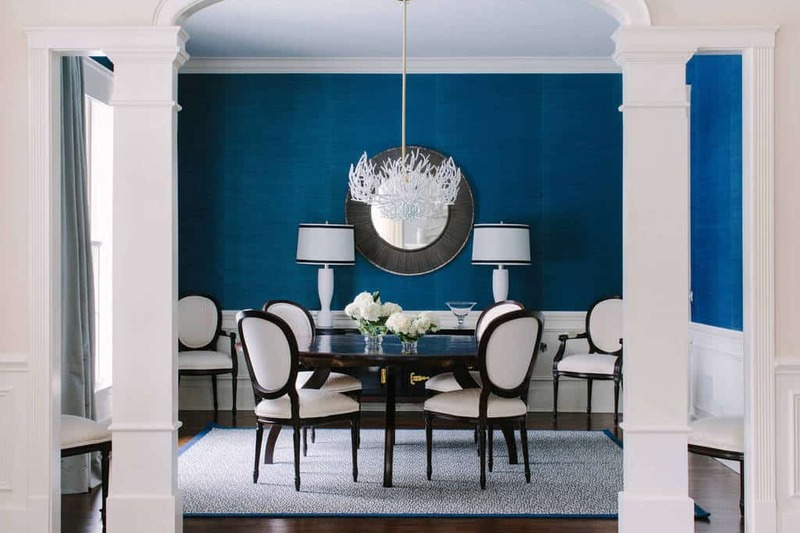 This dining room’s walls are two colors, with a thick blue stripe at the top and snowy white from there down. 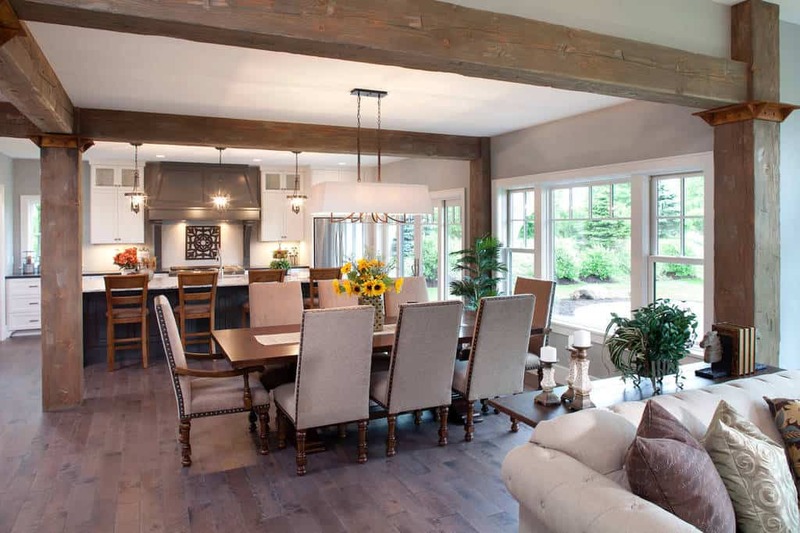 This open-concept combined dining room, kitchen, and living room is perfect for spending time with family or socializing with guests. 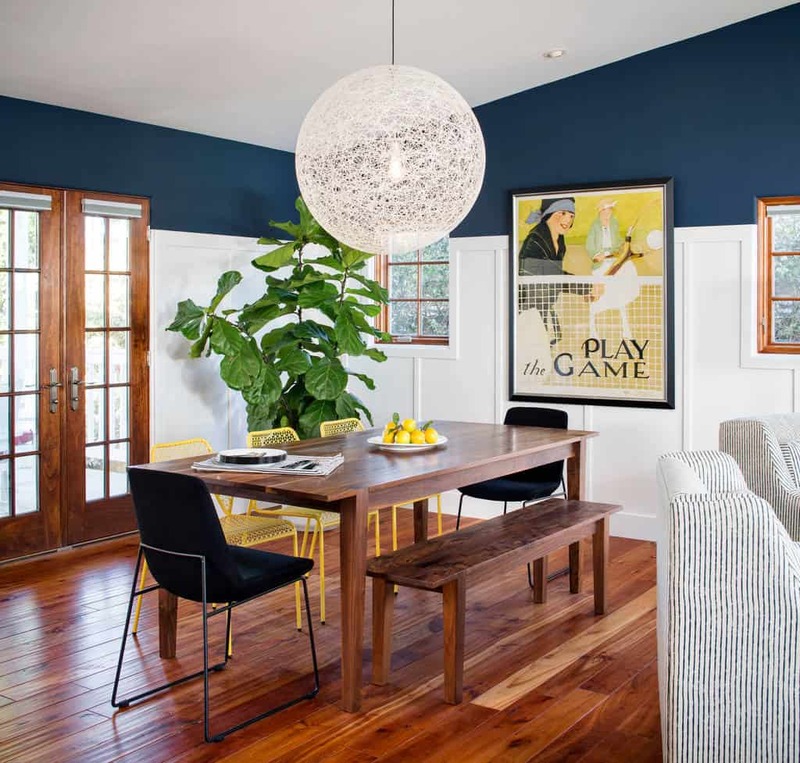 Rich teal walls and ceilings with a faintly yellow pattern are a lovely combination in this dining room. This dining room’s mantelpiece features a unique pattern that complements the rest of the space. 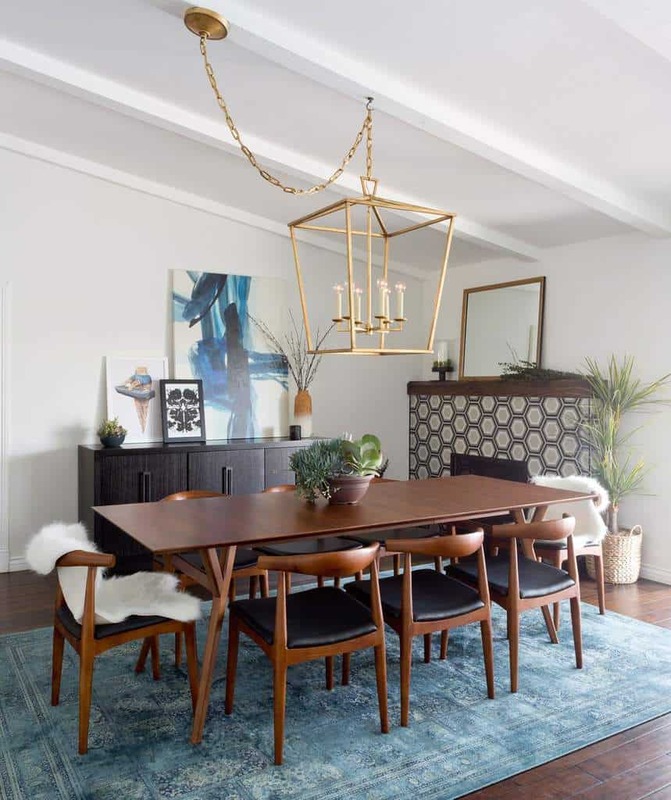 This combined dining room and kitchen is filled to the brim with retro chic. 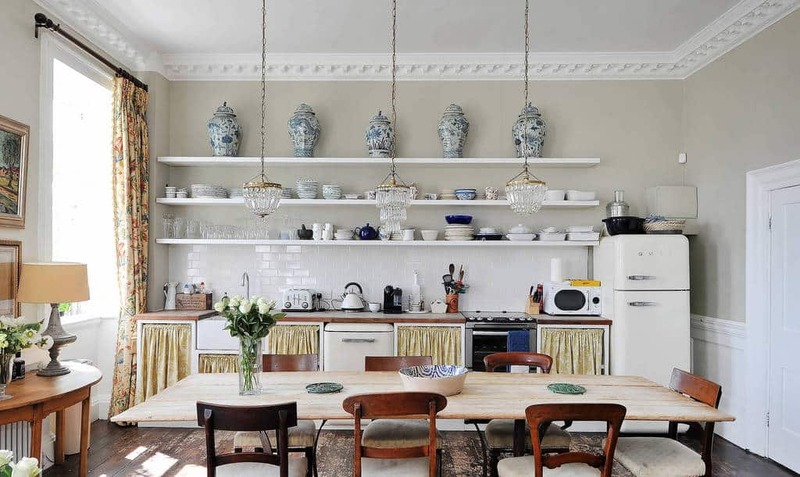 Examples of elements in this style include the distinctly 60s-style fridge, mismatched chairs, and shelves displaying blue and white china. An electric or gas fireplace is perfect for cozy family dinners and dinner parties with guests alike. 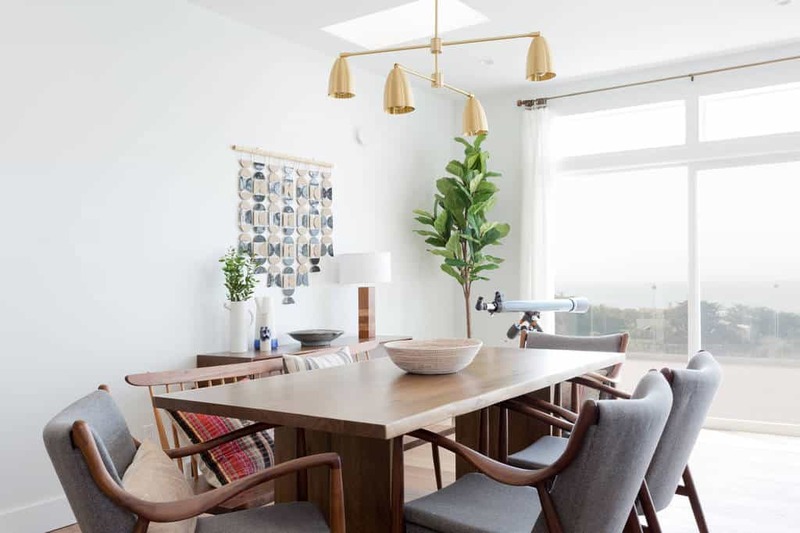 Photo by Peter Rose Architecture + Interiors Inc.
A glossy cherry-wood dining room table and floor in a slightly lighter shade bespeak quality and comfort. These linen-covered chairs add to this dining room’s fresh and breezy atmosphere. 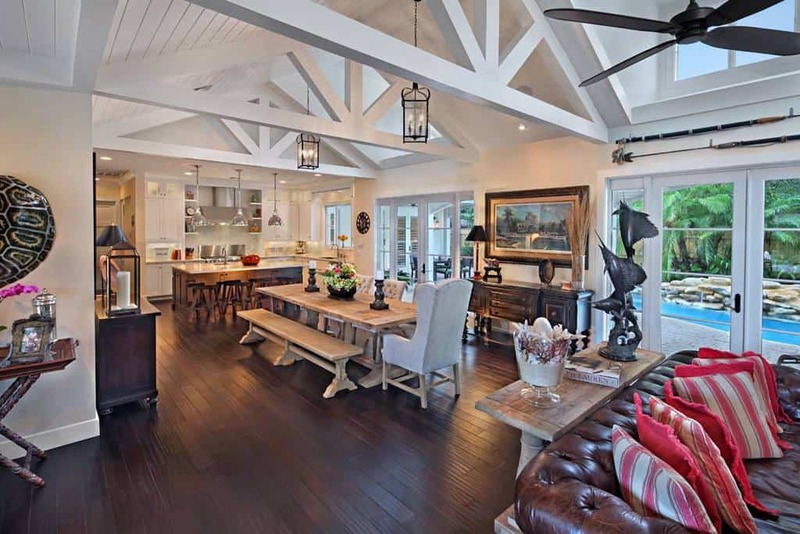 This combined dining room and kitchen’s rustic bench and counters are distinctly evocative of the nineteenth-century. A hanging lamp like this one gives any room a chic and contemporary look. 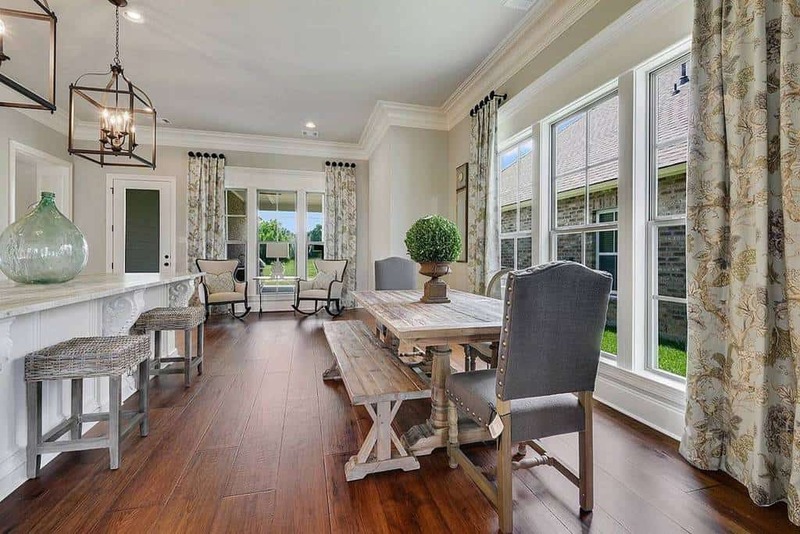 Enjoy a few quite moments in the morning in this practical combined dining area and kitchen, with charming outdoor views through large windows. There’s something distinctly decadent in the look of this gorgeous turquoise fabric wallpaper. 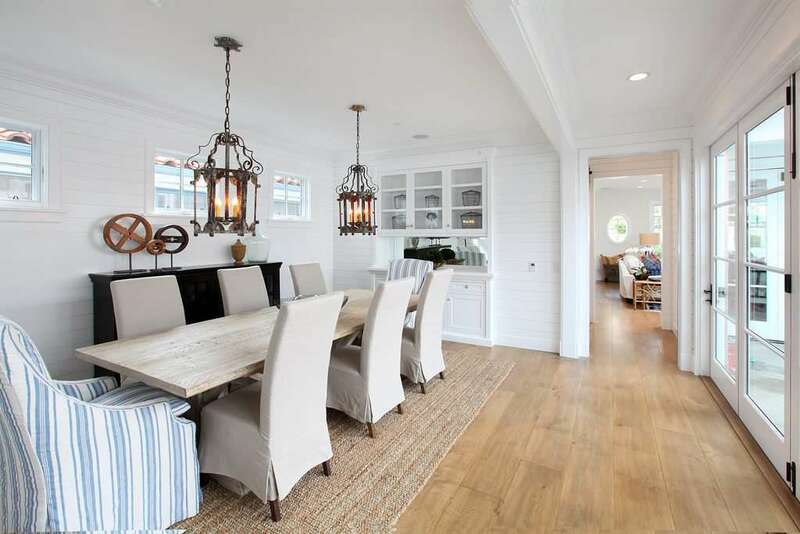 It looks especially beautiful with this dining room’s cherry-wood table and chairs. Photo by Farinelli Construction, Inc. 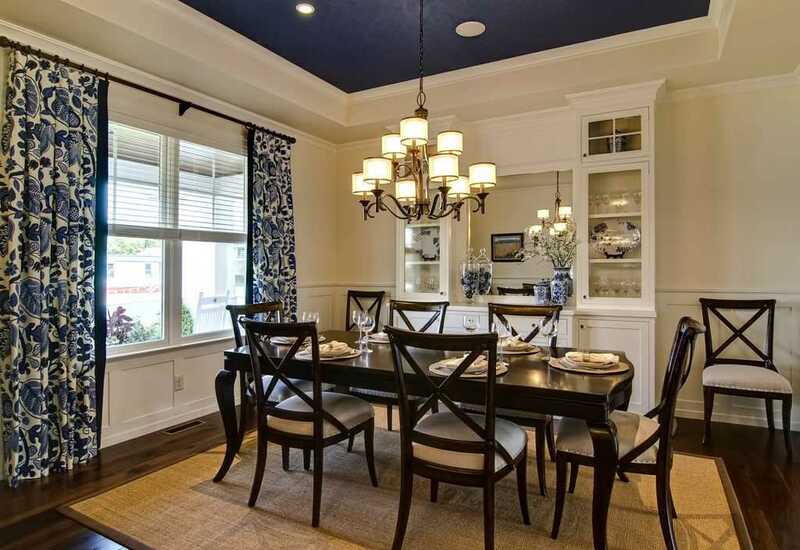 This dining room features lovely floral curtains and a stylish blue ceiling with recessed lights.